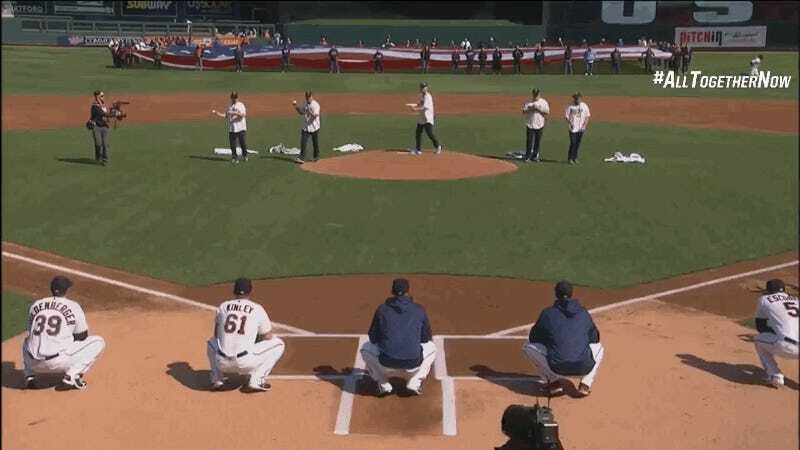 The gold medal-winning U.S. Olympic men’s curling team stopped by Thursday’s Minnesota Twins game to throw out the first pitch, and boy were their deliveries crummy. The combined efforts of (from left to right) Joe Polo, John Shuster, Tyler George, Matt Hamilton, and John Landsteiner resulted in one respectable throw—one and a half if we count Hamilton rolling his baseball to the catcher. Ignore the chyrons in the video, as the majority of them don’t match up with the correct corresponding Olympian. No respect for the curlers. Then again, the curlers had no respect for their catchers. Poor Tyler Kinley didn’t know what he was in for.